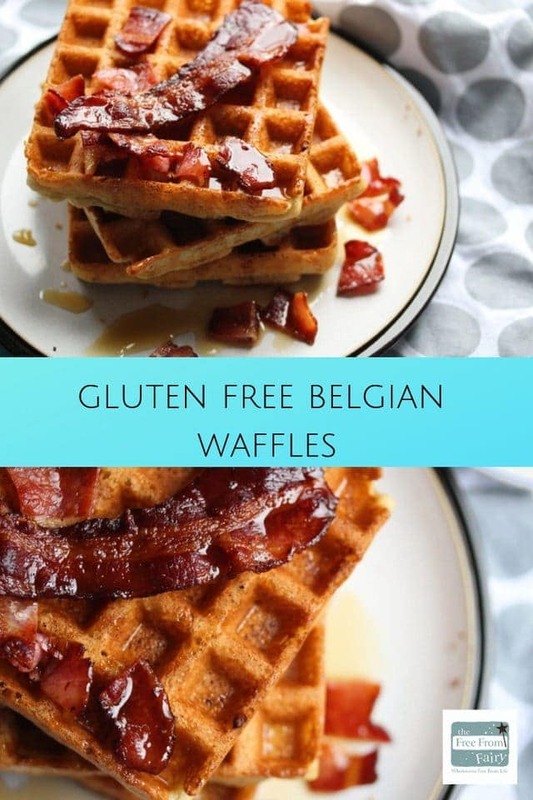 Gluten Free Belgian Waffles | The Free From Fairy. 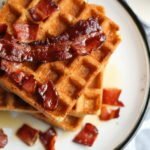 This recipe for gluten free Belgian waffles has dairy free options. 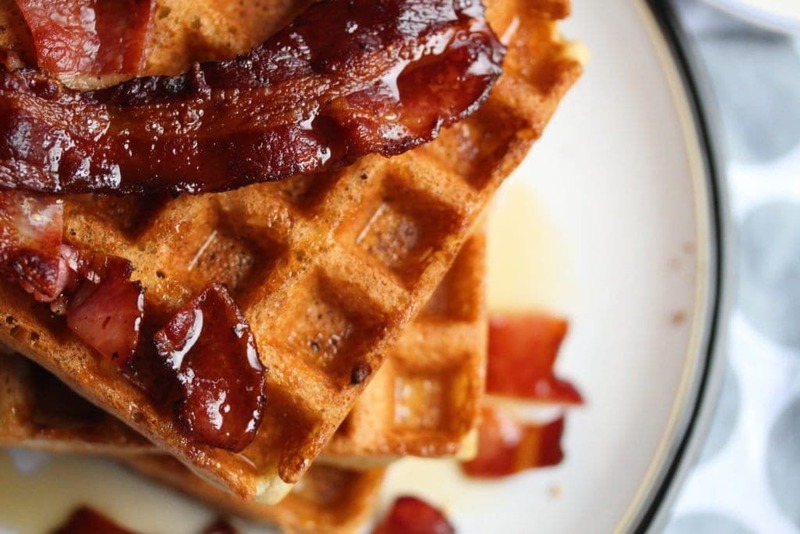 I’ve served them with crispy bacon and maple syrup but you can serve them any way you like. I’ve spent the morning dreaming of luxury. Luxury is not a word that I generally associate with, but it is certainly something that I dream about. When I was asked to work with Juliette’s Interiors to create a luxury breakfast to match one of their beautiful beds I needed no persuading! For those of you who don’t know me, I love my bed. And I mean, really love it. As much as I love food in fact. Sleep for me is as important as my family. I have never liked missing it, even as a small child or as a student. I was never one to stay up all night partying. By 3am the call of my bed was way too strong. Spending the morning, pouring over the luxury beds that Juliette’s Interiors sell has sent my head into a spin. I was asked to choose a bed from their website in which I would like to eat my luxury breakfast. For the first night of our marriage, Mr M and I spent the night in an amazing room with a four poster bed. When I saw the picture of this Italian Button Upholstered four poster bed it reminded me of that very special day and I knew that this was the bed for me. I’m not sure what it is about four poster beds. Whether they remind me of books I read when I was young, or that they just ignite some delicious idea that I could hide in there and nobody would know, I don’t know. Of course, it would look utterly ridiculous in my tiny little bedroom in real life, but for the purposes of this exercise I am imagining I have an enormous, opulent bedroom! Some of you will know that I am currently back on a sugar-free, carb-free diet which doesn’t leave an awful lot for breakfast. I do love a fry up, but that’s not exactly luxurious. I also love a bowl of fruit with plain yoghurt but that didn’t seem to fit such extravagant beds. As I was creating a dream, I thought I’d create a breakfast that in an ideal world I would eat. Mr M and the kids were delighted to have such a delicious breakfast while I chowed down on my stewed apple and yoghurt (dreaming of waffles). There is something about waffles that to me says special, and these Belgian ones are no exception. Compared to my ‘usual’ waffle recipe, these gluten free Belgian waffles take a little longer to make but the extra time means extra special. I use my wholegrain gluten free flour blend to make them. 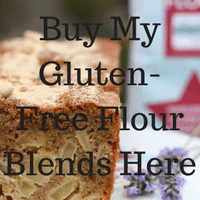 If you’re unfamiliar with gluten free baking then check out this post which explains why gluten free flour is so important. If you are always having baking failures it is more than likely because you don’t understand what gluten free flour is and why it is important. I explain all of that in the article. 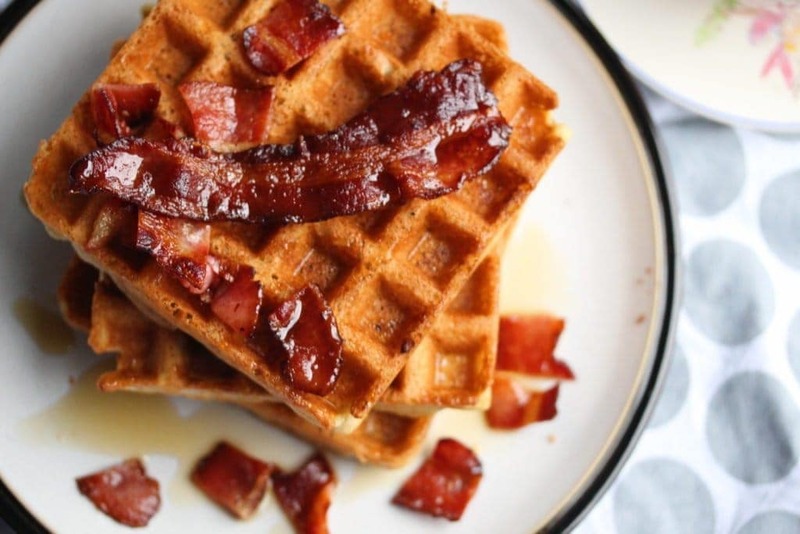 The waffles are light and crisp and are incredible served with crispy bacon, drizzled with maple syrup. A truly luxurious breakfast, befitting of anyone with a four poster bed. I’m hoping that my breakfast idea will win me a luxury breakfast at a local restaurant or hotel. On Friday it will be featured on the Juliette’s Interiors blog along with four other luxury breakfast ideas from other bloggers. 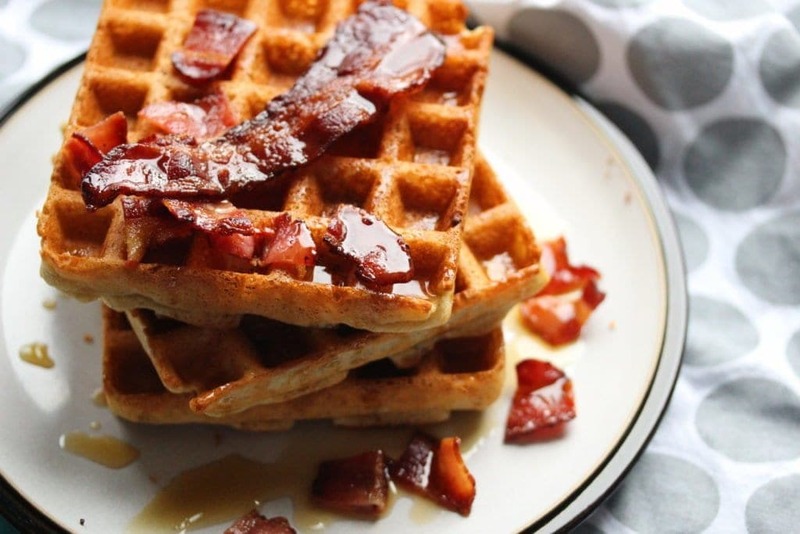 What equipment do you need to make these waffles? I use this Sage waffle maker. It is large enough to make two waffles at once which saves any arguments for the kids. It is also really easy to use and will adjust the cooking time according to how well done you like your waffles. I use my Sage mixer to beat the egg whites together and a handheld mixer, much like this one, to beat the other ingredients together. In addition to that you’ll need a bowl for mixing the ingredients together and a ladle for transferring the batter. So without further ado here’s the recipe. And if you like this one and would like a free copy of my recipe ebook then enter your details below. In it you’ll find recipes for gluten free pastry, bread, pizza, Yorkshire puddings, Victoria sponge, pancakes and gingerbread. Nutrition facts are for information only. They are for the waffles on their own and not for any toppings you may choose. This was a commissioned post that I was paid to write. All writing and opinions are my own. These look so good Vicki. Crisp and decadent…. especially with the bacon and maple. A perfect breakfast indeed. On the waffle-maker front….. what make do you have? I have been wanting one for a while, but can’t decide which is best for GF…. ? ?